A surprising sweet & sour combination to highlight the diced Petit Camembert ILE DE FRANCE®. This gorgeous treat is ideal for an exotic aperitif snack! Crush the cashew nuts then using your fingers, mix in the chilled diced butter, parmesan and breadcrumbs. Bake at 180°C for 3-4 mins. Crumble and allow to cool. 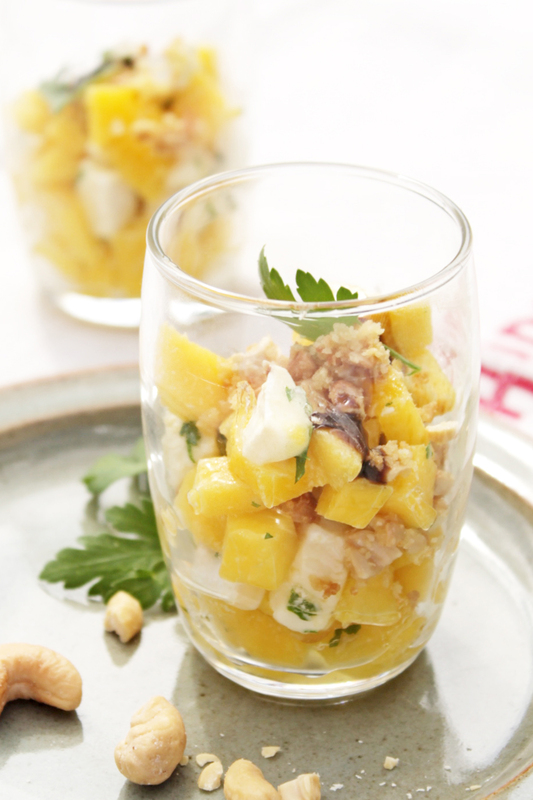 Finely dice the mango and Petit Camembert ILE DE FRANCE® and chop the parsley. Mix. Prepare the sauce with the honey, balsamic vinegar and olive oil, then mix together with the tartar. Season with salt and Cayenne pepper. Arrange in small glasses and sprinkle with the crumble.